Concert Pianist/Composer and Recording Artist for Albany Records, Karen Walwyn, was recently invited by the Center of Black Music Research of Chicago to perform and record the premier recording of the Florence Price Concerto for Piano (Albany Records): “Walwyn provides a magnificent account of the concerto displaying her considerable technical skills”, reviewed by Bob McQuiston at NPR. 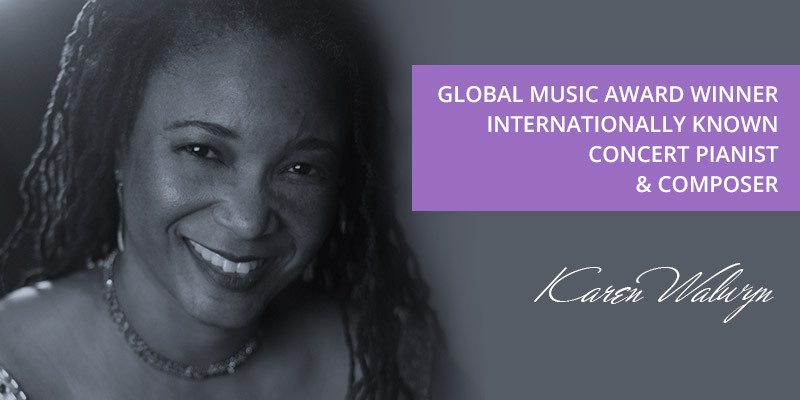 Making her compositional debut recently at the Kennedy Center, Ms.Walwyn received a tremendous standing ovation for her work for solo piano entitled “Reflections on 9/11”. “Imaginatively conceived and executed, it both disturbingly transposes the catastrophe into appropriately cataclysmic sound and artistically suggests the aftermath’s lingering sense of numbing devastation.” reviewed by Robert Schulslaper of Fanfare Magazine. The demand for concerts of this seven-movement ‘tour de force’ work continuously takes her across the nation for command performances. “Karen Walwyn shows considerable range… she is virtuosic, meditative, energetic… and vividly evocative”. Dr. Walwyn has recently completed a year on Sabbatical from Howard University having been awarded a Mellon Faculty Fellowship (2011-12) from the John Hope Franklin Institute at Duke University where she completed her debut choral/solo piano/African Percussion work entitled Of Dance & Struggle; A Musical Tribute on the life of Nelson Mandela debuted by the Elon University Chorale directed by Dr. Gerald Knight. Ms. Walwyn remains busy with concerts of new works, works from the standard literature as well as her own works, master classes and lecture recitals across the country and internationally. Some recent concerts include appearances in Johannesburg-South Africa, Barcelona-Spain, Tenerife- Canary Islands, Salzburg-Austria, London-England, Nice- France and locally to numerous music halls and university campuses including the University of Michigan, Duke University, the University of Indiana, the University of Miami, and the University of Hawaii. As well, learn about Karen’s other passion, which is recorded albums of music to sooth your pet by clicking here.